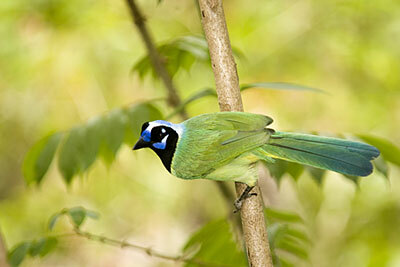 Green Jay can be found from southern Texas, through Mexico and Central Amercia south to Venezuela and Bolivia. This beautiful bird is the only green jay in Mexico. Although to call it simply “green” is a great underestimation of its complex design. While its upper parts, including upper part of tail are indeed green, its belly and sides of tail are yellow, throat patch and face black and crown with cheeks blue. Two white patches over and below the eye complete its facial features. Certainly one of the prettiest birds in our area. But Green Jay is not only pretty. It has also very interesting life-style. Omnivorous, these jays will consume a large variety of food items including insects and other arthropods, small vertebrates, seeds, and fruit. Birds usually forage in family flocks. Their socializing is not limited to feeding, though. In southern part of its distribution range the flock consists of fixed year-round members. There is the breeding pair and then a number of non–breeding jays from the last season, who forage to help feed the nestlings. An advantage of such design to the breeding pair is obvious. The helpers on the other hand might be benefiting by sharpening their baby-sitting and hunting skills, which will help them become better parents in the future. Also, the hatchlings, being likely their relatives, share a portion of genetic information with their helpers. Therefore helping to ensure their survival ultimately translates into mayor dispersal of their own genetical information. In the Bay of Banderas area these birds can be observed all year round. Being rather shy, they prefer quiet forest environment and are rarely seen in suburbs. A common give-away of their location is their unmistakable call.